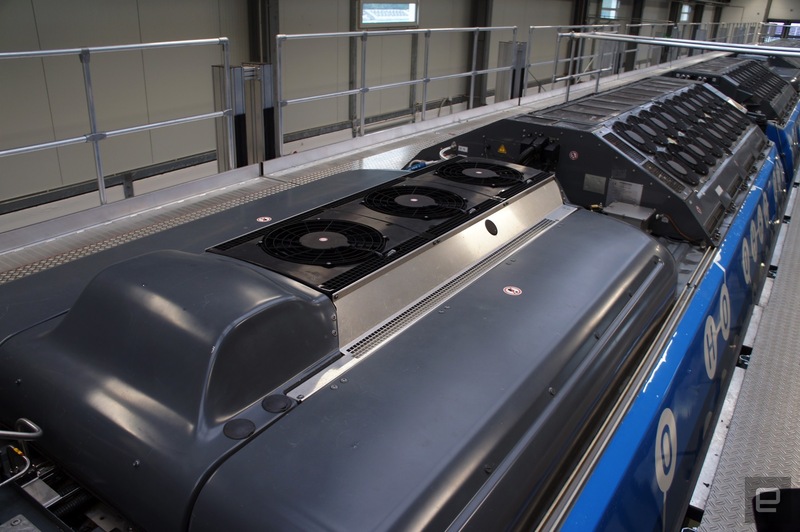 Alstom's hydrogen-powered Coradia iLint paves the way for cheaper, quieter trains. The rail industry has a problem: Its infrastructure is decades, sometimes centuries old, and it is hugely expensive to upgrade. Diesel-powered trains dominate, but fuel is getting pricey, the trains are noisy and they're terrible for the environment. French multinational Alstom believes it has the solution: a hydrogen-powered train that can be swapped in for its diesel equivalent. Say hello to the Coradia iLint, the hydrogen train of the very-near future. The Coradia iLint is the first of a new wave of trains that uses hydrogen in place of diesel in an attempt to cut costs and help the environment. The first production models are being tested on real German railways right now and are due to go into service by the middle of 2018. And, depending on how the hydrogen is sourced, the iLint could cut emissions by up to 100 percent. Diesel trains have been used for the better part of a century on pretty much every railway of note because they're very cheap. 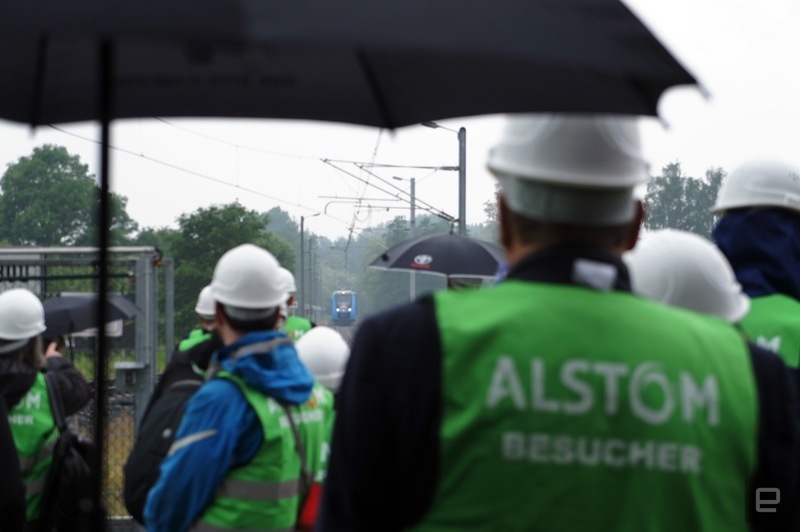 Moves to add electric power to railway lines have taken place, but it's hugely expensive: Alstom puts the figure at €1.2 million per 1 km, or $1.4 million per 0.6 miles. Of course, these days, most governments simply can't afford to bankroll large-scale electrification. Battery-electric trains, too, are out of the question, thanks to the sheer size, weight and cost of a battery that could run for 1,000 km on a charge. Hydrogen as a fuel, on the other hand, behaves pretty much like diesel, has a much higher energy density and it only takes 15 minutes to refuel a tank. And on trains, where weight and aerodynamics are less of an issue, you can add more tanks depending on your needs. From the outside, you certainly wouldn't have guessed that the Coradia iLint is a hydrogen train, looking just like its diesel-powered predecessor. But when it rolls up to approach you, you'll notice how deathly quiet it is: Aside from a little whine from the engine, you'll barely hear it. In fact, the squeak of the wheels against the cold morning tracks were louder than the train itself. Only the air brakes, which are as noisy here as on every other train, are noticeable. The train looks and feels like pretty much every other European multi-height train I've ever sat in. There are lower decks for wheelchairs, bicycles and passengers, with steps to raised sections with additional seating. The only difference you'll spot is the livery outside, which boasts of its fancy new power supply, and the upholstery, which is patterned with H2 symbols. I rode on the prototype along Alstom's test track, which surrounds its enormous train factory in Salzgitter, Germany. Because the track isn't that long, the iLint prototype is limited to 80 kmph, but on a real railway line near Bremerhaven, its top speed is double that. Plus, the prototype has slightly smaller fuel tanks: It can only run 800 km on a tank, compared to the 1,000 km of the production model. The train is based on Alstom's existing Coradia Lint diesel trains, but with an engine system similar to any FCEV (fuel cell electric vehicle). The wheels are driven by an electric motor embedded in the chassis, and beside it is a battery that maintains a constant flow of power. Above the cab, meanwhile, are the hydrogen storage tanks, and the fuel cell is in the roof in the middle of the train. One other difference between iLint and the production model is the fuel cell wasn't covered in sound insulation. Intentionally choosing to sit beneath it, then, meant that I could hear it in operation as we rode along the track. And, if you're curious, it sounded like a bunch of demons screaming at each other from the other side of an airplane hangar. I am told, however, that the production models will not make this sound, probably to avoid freaking out the passengers. "It's obvious that diesel will die," said Alstom's German chief, Dr. Jörg Nikutta "and with batteries you could go, say, 50 km." Those looking to travel any further, as most rail passengers do, will find that hydrogen is the only option. Dr. Nikutta added that rail operators should find a hydrogen train doesn't cost that much more compared to the equivalent diesel train. Since the new model is, essentially, an FCEV in train form, its fuel and maintenance costs are significantly less than existing models. The iLint has a modular design, making it easier to swap out parts should they fail in the future. When all of these factors are taken into account, the train, while pricier initially, will, according to Dr. Nikutta "break even within the first ten years." Alstom has intentionally made the iLint as uncontroversial in its appearance and operation as possible. It is doing so to prove to rail operators across the globe that they can simply swap out a diesel train almost without any changes. The only differences should be in the lower cost of operation, the quieter sound and far-smaller carbon footprint. Oh, and the fact that train yards will now need a little hydrogen filling station alongside their diesel ones. Nikutta added that while a diesel train would generate 1.2MW of power, the iLint only requires 50 percent of that. Thanks to the better torque offered by an electric motor, the energy needs of the train are sliced in half. Not to mention that, depending on how the hydrogen is sourced, it will offer between 45- and 100-percent less carbon emission than diesel. The hydrogen train is coming, and you'll see plenty more of them popping up in Germany over the next few years. Alstom has signed deals with a number of operators in the country, which will see it building 60 trains over the next five years, with more coming in the future. And the UK is also likely to go big on hydrogen in the near future, since it, too, cannot afford to electrify its wider rail network. One train company, Abellio Greater Anglia, has agreed to hand over a number of its soon-to-be-retired Class 321 commuter trains. These vehicles, originally built in the late '80s, will be refurbished as hydrogen trains and returned to the UK. I was curious why Alstom would disassemble a thirty-year-old train rather than build something new from scratch. Apparently, the cost of testing and certification required for new hardware, even from an existing design, is too much for many companies. And in the UK, where less than half of the rail network is electrified, hydrogen trains could prove to be a huge weapon in the fight against climate change.